Savannah Cats originated from a cross between an African Serval and a Domestic Shorthair (DSH) cat. The original F1 (1/2 Serval, 1/2 domestic) males are not fertile. Females were chosen and bred down to the F5 (5 generations removed from the Serval), and males became fertile. The fertile male Savannahs were bred with female Savannahs creating the breed now known as the "Savannah Cat." The ideal Savannah has many characteristics of the African Serval, yet is a breed of cat unlike any other. Long, lean yet strong bodies, tall ears, hooded eyes, bold spotting and short tails make the beautiful Savannah unique. The Savannah personality is out-going and fun-loving. They are playful and engaging, often enjoying water, and always enjoying companionship and playtime. These intelligent cats are active and imaginative. For those who wish to have a cat who is involved with the family, a Savannah may be the perfect choice. 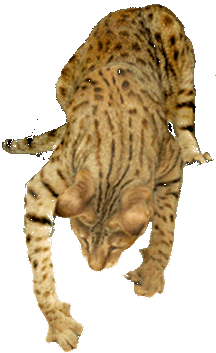 Halestone Savannah Cats is located in southern California. We are a small cattery able to dedicate time and love to each cat and kitten in our home. We are very proud of our Savannahs! All Halestone kittens grow up in our house, learning good house manners and litter habits. Early socialization enables them to blend easily into your family. The decision to add a kitten to your family and your lifestyle is an important one--it's even more important that you find that special kitten that can grow up within your family and become a beloved pet for years to come. Our mission at Halestone Savannahs is to breed and nurture top-of-the-line, healthy, happy, kittens and match them with owners that will love and pamper them as much as we do!